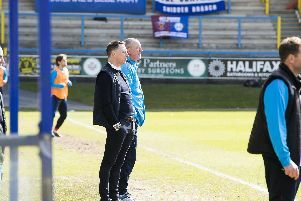 Town boss Billy Heath admits he feared another hard luck story before his side fought back to claim a crucial 2-1 win over strugglers Gainsborough at The Shay. Halifax lost 1-0 at home to Gloucester on Saturday after creating the better chances, and found themselves a goal down at the break having dominated the contest up until then. But a Chris Salt own goal and Adam Morgan’s late strike moved Town back into the play-off places. “You’re thinking deja vu,” Heath said. “We’ve dominated the game, we’ve had more possession, we’ve had numerous opportunities and you think ‘here we go again’. It’s just frustrating, and the players are frustrated because we don’t the goals we deserve at the minute. I’m not being disrespectful to Gainsborough but if we’d finished the game with five goals, you couldn’t have argued with it because we had great chances but they’re just not hitting the back of the net. As soon as we start doing that it’ll take a lot of pressure off us because you’re in a pressurised situation whatever game you’re playing. Heath admitted poor defending from his team led to Gainsborough’s shock opener, and said he knew it would be an uphill battle to get back into the game after that. “For the first 25 minutes, half an hour, we were fantastic,” said the Town boss. “Their goal was their first attack. We had some good opportunities and it looked a matter of time when we were going to get the goal. But we made a bad choice from our free-kick, we go short to the full-back, then we give an awful pass and they get the goal. That’s so frustrating because it’s from our free-kick. “They were fighting for their lives and we knew what was coming second-half, they tried to break it down and stop and start the game. I don’t have any problems with that. We said if we got the goal we were confident we were going to get the winner. Town’s equaliser was their first goal at The Shay in four-and-a-half hours of football, while The Shaymen have only scored in two of their last five games. Loanee Dion Charles produced a sparkling performance in his second appearance for Halifax, and impressed the Town chief. Heath said it was “too early to say” about the extent of Matty Kosylo’s hamstring injury. Heath also said he would hopefully be able to add to his squad before Thursday’s transfer deadline, and was targeting two additions to his team.